Is your pool deck cracked and uneven? How about your driveway or walkway? We have all seen these areas with large, unsightly cracks that not only affect the appearance but also create a trip and fall hazard for you and your guests. We have all seen these areas repaired, and most of the time the repairs look worse than the actual damage itself. That’s because most company’s or handymen just simply fill those concrete cracks with a cheap caulking or rough cement, and then paint over the area. Nine times out of ten you can see exactly where the repair was made, and in most instances, within a year the area is separated and the concrete cracked all over again. Not good. Like everything else that we do, at CPS we do it right the first time. We don’t just throw caulking in the rack with a dab of paint. That’s for the amateurs. We are professionals. The first thing we do is determine exactly why the area is damage, what has caused it? A tree root? Ground settlement? A leaking water pipe under the area? Cement just doesn’t fall apart, there is always a reason. 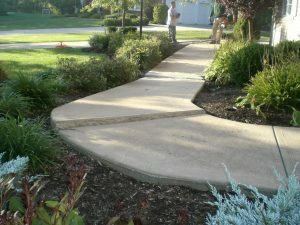 We grind the entire cracked area out and clean the damaged and corroded concrete thoroughly. Next, we apply injection molded synthetic cement based material into all of the cracked areas. The area is then texturized to match exactly the texture that you have now. The area is then painted to finish with the exact color match of the surrounding area. 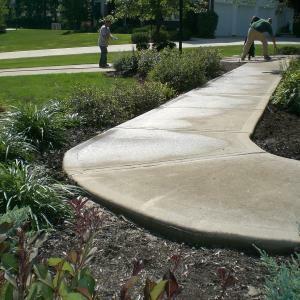 Now your unsightly concrete driveway crack is repaired, and your driveway or deck looks like new again with no signs that there was ever any damage or problem. And we are so sure of our work, that we offer a two-year warranty on any repairs. No one does that. No one. We do because we know how good our work is. Let’s take an unsupported patio deck on your typical Florida high rise. Before the patio decking is poured, the deck is formed with bars of steel called re-bar ( reinforcement bar). The cement is then poured into the form to shape the deck. railings are then bolted onto the outside of the deck. Over time, water seeps into the small cracks and holes made by the railing hardware. This water causes rust on the rebar, which then swells and cracks the cement decking. If left for too long, the rebar starts to lose all of its support capability, and the patio cracks, crumbles and becomes very dangerous. We will not only repair this, we will also seal the area to prevent any further deterioration. When completed your deck will not only look brand new, it will also be structurally sound and safe to be on. For our commercial customers, we offer special annual contracts that provide for us to perform a complete structural inspection and maintenance of these areas. We look at everything and provide you with a detailed list of exactly what we have found, and how we are going to correct the problem. Annual inspections provide you with the necessary information you need to head off a disaster in the future. And it is far more cost efficient to do an annual inspection and maintenance. Too many times property’s wait until they have an actual collapse or pieces falling from an area to address it and take care of it. Wouldn’t you rather spend a fraction of the money to perform a simple repair, rather than spending a fortune to complete a major restoration? Not to mention the liability factor that this can bring. So whether it is for your home, or a high-rise on the beach, at CPS we can take care of all your cement repair and restoration projects, and you have the assurance knowing it is being done right the first time. We Guarantee all of our services and will quickly respond to any issues that may arise. If you want it done correctly the first time then call us today @ 239-249-5290 or request a free online estimate. You will be glad you called us first. We are absolutely the most reliable concrete repair company in Southwest Florida.